This November I spent some time photographing in Binyamina, Israel. I am not far from the Mediterranean Sea, in Israel’s coastal plain region. 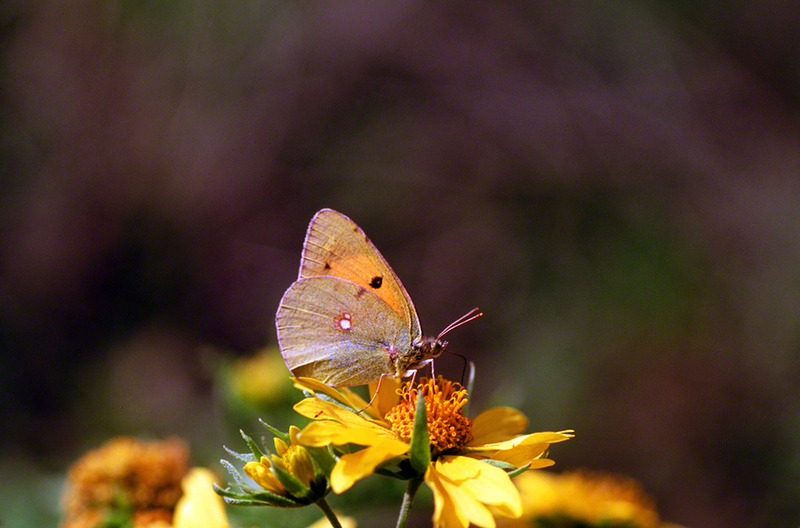 The butterfly, Colias croceus has found Camphor weed flowers along an agricultural road that skirts this beautiful town. It’s so different, for want of another word, to be photographing nectaring butterflies in late November, at least for this Pittsburgh guy. My grandson was born 2 weeks before, and I arrived in time for the celebration. I brought my film camera, gear, and unique clothing for field work. The TSA in Pittsburgh and in my New York stop all gave me that look when I raised my Ziplock gallon bag to let them see that I had 50 or so rolls of slide film for “Hand Inspection.” To their credit they all inspected it promptly and pleasantly. Camphor weed was one of only two plants in flower along the farm roads that were within walking distance of my Dina and Misha’s home. It was magnet of nectar for the butterflies flying at the time, so I camped out there for several mornings. There were few Clouded Yellows to be seen. They look quite a bit like other yellows in the United States. If it ain’t broke, as they say, don’t fix it. Jeff, not only a good shot but also a beautiful butterfly.